Trey Smith (Buildbox CEO) and Nik Rudenko (Buildbox CTO), have been quietly releasing bits and pieces of Buildbox 3 info on their social media and our community forum. So today, I’ve collected some cool pieces here to show you. All of these exclusive sneak peeks are hints at some of the new features and capabilities you can expect to see in Buildbox 3 and at our upcoming reveal event. Presets have been an integral part of Buildbox since the beginning. It’s been the starting point of major games like Color Switch, the Line Zen, and many more hit games that took over the app store. These first sneak peeks were posted by Trey Smith on his official Twitter page earlier today. You’ll see him show off a pool preset they’re finalizing, as well as the GIF preview of another preset called “Deep Fly”. Our forum is another hot spot for getting exclusives. Nik Rudenko has been posting some amazing inside first-looks of the software there. In the thread series that he likes to call “Concept Fridays”, Nik shares different game design concepts that you can implement in Buildbox 3. In one example, he shows how easy it is to build game objects with the new node editor inside of Buildbox 3 Beta. In the screenshot below, you can see how we can do a cool trick with Wake Up. Let me explain how this works: We have a Start Node that brings a blank object to the scene. We immediately attach a 3D model to the object (which in this case is a white cube). 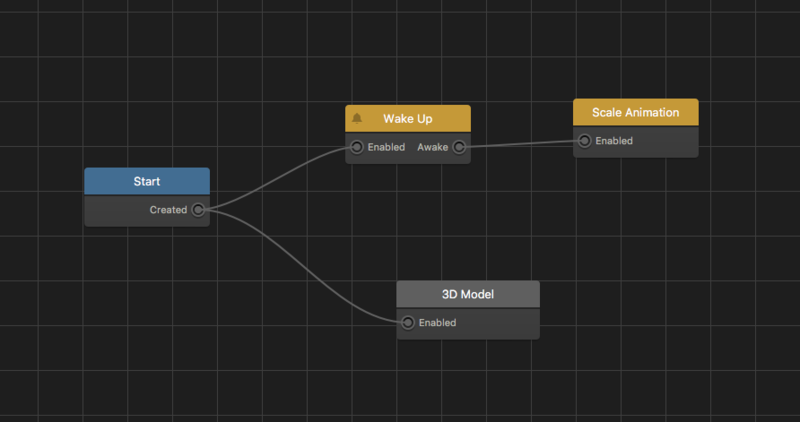 We also immediately attach a Wake Up node, that is always looking for a character coming close to it. What happens when a character comes close to it? Well, it becomes “Awake” and you’ll notice we draw a line from the Awake Port to the Scale Animation. Pretty cool, and that’s just the beginning. What would be the main reason to use this over Godot? Hello, I already have the first subscription with the 15€ in buildbox 2. Will buildbox 3 be free for me? Hello , Where can i get BuildBox 3 ? i already have BuildBox 2 . When will buildbox 3 be available to everyone? Is this the 25th or 26th of July US date it’s a bit confusing when you’re a day ahead of US time. Hi Wayne, it’s the 26th of July US date (on your own time zone). Hi Christine, please email our support team at support@buildbox.com they’ll help you. Same problem at my end. I have an Business meetin on Thursday, so kindly make the footage available for rewatch. Super exciting!! But will the reveal event be available for rewatch?